MEXICO – The Friends of Mexico Point Park are excited to announce a stained-glass window design contest for Casey’s Cottage. The cottage is located on the grounds of Mexico Point State Park and was converted in the 1930s from a carriage house into a living space in the style of a medieval manor. It has eighteen tall narrow windows in the “moat” area which were fitted with stained glass. However, these windows have fallen into disrepair and we want to replace them with newly designed and properly constructed Tiffany style stained glass windows that will let in light and color and complement the decorations on the interior walls of the cottage. We are inviting the community to design the new windows. Brass plaques with the name of the winning window designers will be permanently placed under each window. Mexico Point State Park is a 122-acre park on the shore of Lake Ontario in Mexico, with nature trails, swimming, and a history dating back to the Revolutionary War. The jewel of the park is Casey’s Cottage, former carriage house to an elegant restaurant and hotel that was popular during the late 19th and early 20th centuries. One of the annual guests of the hotel in the 1930s was William Casey, a sociology professor at Columbia University who worked with students and his artist friend, Severin Bischof, to transform the carriage house into a medieval manor house. 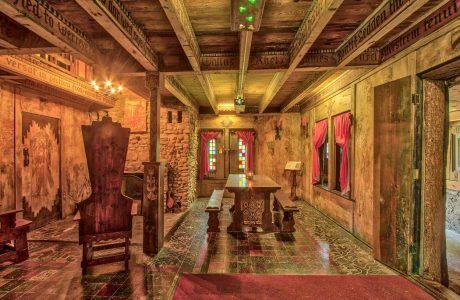 They carved pictures of people from medieval times and verses in old English and Latin on the walls, created stained glass windows and transformed the cottage into a unique and beautiful place. The 18 windows are not of any standard shape or size but were designed to represent the narrow windows in a castle through which defenders shot arrows at enemies attacking the castle. They are approximately 4-5 inches wide and 20-30 inches high (some are smaller and some are larger), roughly rectangular with a peak at the top. We would like to involve the community in the creation of the windows so that they can feel the excitement that Casey and his students must have felt when they first designed the cottage and created all of the artwork that makes it unique. The 18 chosen designs will be adapted to stained-glass designs by a professional stained-glass artist. The design must complement the art of the cottage and the final 18 window designs must be harmonious together. We might have to substitute different colors than the designers chose in order to accomplish this. There will be three judges who will choose the designs. The long thin shape of the window openings presents a challenge for the designers: 4-5 inches wide is not wide enough for a very complicated design. A simple floral design would be nice for some of the windows, incorporating the flowers on the wooden statues displayed throughout Mexico Point Park: Trillium on Joseph Brant, Pink Lady’s Slipper on Grace, Black-eyed Susan on Maud and a Wild Rose on Carmen. Other possibilities might be suggested by studying the carvings and pictures on the walls inside Casey’s Cottage. Three stained glass artists will build windows from the winning designs and install them in the openings in the “moat” along with a brass plaque under each window with the name of the designer. For pictures of Casey’s Cottage and for more information please visit us on Facebook or at www.mexicopointpark.com. Casey’s Cottage will open for the summer season May 4. The hours will be Saturdays and Sundays 2-4 p.m. Please print your name, address and phone number on each design drawing. If you are under the age of 18 please include the grade you are in and which school you attend.